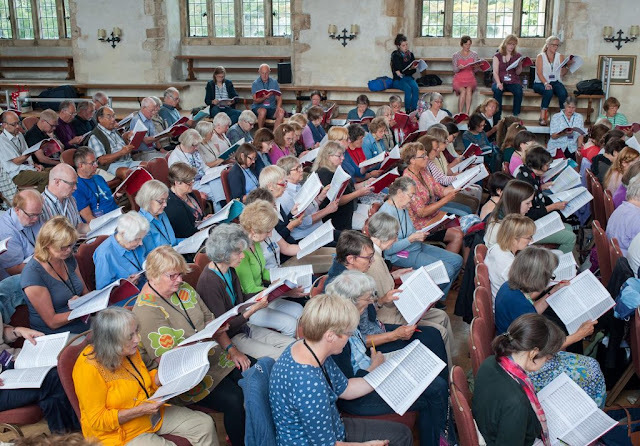 Dartington International Summer School and Festival, artistic director Joanna MacGregor, runs this year for four weeks from 29 July 2017, combining a music school with a lively concert venue. The four weeks of courses provide the opportunity to perform in the Florentine Intermedi of 1589 with Andrew Griffiths, Handel's Samson with Laurence Cummings, Purcell's King Arthur with Robert Howarth (plus coaching from Carolyn Sampson and Andrew Watts), Britten's Peter Grimes with Sian Edwards (plus Paul Nilon in the title role), and Sondheim's Sweeney Todd, to take part in classes, workshops or masterclasses with vocal ensemble Stile Antico, soprano Emma Kirkby, counter-tenor Andrew Watts, harpsichordist Steven Devine, violinist Thomas Gould, cellist Adrian Brendel, composer Michael Finnissy, composer Howard Skempton, perform in the Advanced Baroque Orchestra under Robert Howarth, to study Middle-Eastern Singing and much else besides. Then during the evening there is a tempting array of concerts, many performed by the coaches and tutors from the daytime courses so you can hear viol ensemble Fretwork, soprano Emma Kirkby and counter-tenor Nicholas Clapton in lute songs, vocal ensemble Stile Antico, composer Stevie Wishart, recorder player Jill Kemp and pianist Gavin Roberts, soprano Carolyn Sampson and pianist Joseph Middleton, the Heath Quartet, pianist Pascal Roger, and pianist Joanna MacGregor, plus of course the results from the daytime courses. All in the confines of the restored 14th century estate, full details from the Dartington website.